Family Transition Place (FTP) in Orangeville will soon be benefiting from the efforts of the 100 Women Who Care Caledon. 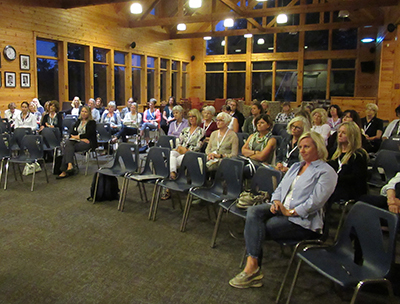 The women gathered for their third meeting last Wednesday at the Caledon Ski Club. About 50 women attended the meeting, although it was announced that the organization now has over 100 members, something those in attendance were very pleased to hear. Participants were able to nominate an organization ahead of time, with three of them being randomly drawn. Each participant had pledged to contribute $100. The nominators were then given five minutes to make their pitch to those in attendance. Jennifer Innis spoke on behalf of FTP, saying the shelter has been at capacity the past nine years, helping those in Dufferin-Caledon, which includes women, men, and children. Part of the problem is that with Caledon being part of the region of Peel, they have limited space, she said, with the closest shelters being in Orangeville and Brampton. She explained that last year 65 women received addiction and outreach support last year. FTP helped 98 women and 59 children find refugee place, while clinical councilors worked with 361 women over the age of 16. “I wish that I could stand here and tell you that domestic violence doesn’t happen in Caledon,” but joined to create awareness and end the stigma towards it. Last week’s efforts raised a total of $7300 in an hour. The other nominees were the Caledon Parent-Child Centre (CPCC), and the National Wildlife Centre of Canada. Angela McKinnon spoke on behalf of CPCC, saying they rely on four full-time dedicated employees as well as donations. Jane Ansara spoke for the National Wildlife Centre of Canada, saying she moved from Toronto recently to get close to nature, and they are looking for more permanent and mobile facilities to treat animals, both locally and nationally. They are also looking to make Caledon their home centre. The centre currently has one mobile hospital, the only credited wildlife hospital in Ontario. Ms. Ansara said some animals were brought from the Niagara and Ottawa regions recently, and they had to send them back to the wild after repairing their broken bones. For more information on the organization, go to www.100womenwhocarecaledon.com.